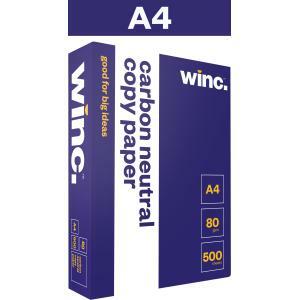 Winc Carbon Neutral Copy Paper is an Australian made paper that offers exceptional value for money. It is fully tested and approved to work consistently through all office printers, faxes and photocopiers. Winc carbon neutral has a smooth surface, high opacity and bulk, which delivers exceptional print quality and is suitable for both single sided and double sided printing and copying. Made in Australia from PEFC certified plantation timber, Winc carbon neutral is produced from Elemental Chlorine Free (ECF) pulp and is Acid Free with archival properties of 200+ years.